The following essay is written in response to – Write a literature critique, which presents at least six pieces of literature which highlight the challenges facing institutes in conceiving spaces for learning that are, in the end, likely to meet the ever-evolving needs of learners into the future. In 2008, the Melbourne Declaration on Educational Goals for Young Australian was written on which an understanding of the need to develop a learning environment that supported, enhanced and strengthened the capabilities of children for the 21st century was founded. As educators move towards the commitment made in the declaration, foundations have began to be set for the social, physical, emotional and cognitive development of learners through establishment of an Australian Curriculum, various state and federal government building and infrastructure programs and Australian teaching standards. The challenge for government and educational departments is designing the spaces for learning needed to cater for the ever evolving needs of learners. The traditional role of the professional designer was generally deemed as the purveyor of all creative and innovative processes, however the works of Brown (2008), Dorst (2011), Kuratko, Goldsworthy and Hornsby (2012) and Kolko (2010) all contend that the design process should belong in the hands of the intended beneficiaries of the designed service or product. Brown (2008) and Kuratko et al (2012) extends the architect of the design process to include teams of people such as the work place. Each emphasise the point that these designers are not experts in the field of designing, but are workers in the workplace, who have been guided through the design thinking process. The design process however is the basis of several pieces of literature that attempt to explain the thinking or theory about the practices involved. The tensions and similarities of these explanations highlight the complexity that faces anyone undergoing any transformation of an environment. In an article for the Harvard Business Review, Brown (2008) focused enthusiastically on the concept of ‘design thinking’ and argues that design thinking, as opposed to the approaches taken by traditional designers, uses methods which closely analyses people’s needs with what is feasible and viable. He contends that design thinking, which requires an initial immersion stage so as to empathise with the client and identify the problem or need, is essential to gain a picture of needs, likes and dislikes. Kuratko et al. (2012) reiterates the processes presented by Brown (2008) but rather than simplifying the ‘spaces’ of the process, expands design thinking as a number of steps that the designer will follow. Unlike Brown’s (2008) prototyping labelling, Kuratko et al (2012) define the central stage of the design thinking process as ‘iterations’. An essential component of iterations is the three step play, display and watch-the-reply. Kuratko et al (2012) attempts to give the process of design thinking a greater linear stepping stone approach with steps back in the iteration process, while Brown (2008) encourages a flow through. Kolko (2010) pulls even further into the iteration or prototyping stage of designing and elaborates further to explain the synthesis of the artefacts created. As well as producing a product as a result of the end design thinking process Kolko (2010) contends that a more tangible form of ideas, thoughts and reflections is needed. This forces the designer(s) to externalise the process into a physical realm, which enables the non-designer(s) to make sense of the acts of prioritising, judging and connections synthesised. Although design is perhaps thought more as a function of product creation, Dorst (2011) in his article that explores ways in which core design practices can be used for problem solving and innovation, identifies ‘design thinking’ as a paradigm for dealing with problems in many professions. By understanding basic reasoning patterns, and the establishment indentifying knowns and unknowns, Dorst was able to draw out the productive thinking of abduction. A value is created through the creation of a working principle and ‘thing’ or object. By knowing the working principle and value, a ‘frame’ is established and the object can be created. Dorst (2011) contends that these frames are influence by levels of design expertise, the kind of design activity and the layer of the design, such as whether it is a project, a process or in what field it is carried out. As with Dorst (2010), Kolko sought to use the concept of abductive thinking to develop frames for object creation. However Kolko (2010) proposes a method of reframing or a shifting of perspective to see things in a new way. The frame definition by Kolko, although similar to Dorst’s working system and value, describes it more as the context that can be shifted to produce new design implications and constraints. Buchanan (1992) discusses the indeterminacy of problems faced by a designer and references the work of a mathematician and designer, Horst Rittel, who in the 1960s identifies that problems can have no stopping rules; operations are exhaustive and each problem is a symbol of another problem. The label ‘wicked problems’ is identified by Buchanan as a source of tension that exists between designers. The process of design can change the perceptions of the problem, so shifting the placement of the boundaries of the problem. This shift in placement can lead to what is described as the intuitive or serendipitous quality of a designers work (Buchanan1992). The works of Brown (2008), Dorst (2011, Kuratko et al (2012) and Kolko (2010) place little thought into how ultimately problems may not have a final solution and will undergo continuous shifting. In an early work of Hatchuel and Weil (2003) they contend that earlier definitions of design lacked clarity and precision, and sought to propose a more unified design theory called the ‘C-K theory. It is through this theory they argue that creative thinking and innovation, which had for so long been external to traditional design theories, could be incorporated in the central core of design theory. The ‘C-K theory’ seeks to identify that design is primarily concerned with knowledge development or expansion, and through the use of ‘knowledge and concept spaces’, new knowledge is created. Hatchuel and Weil (2003) outline in detail the process of turning an initial knowledge into concepts through a disjunction, or a pulling apart operation, with the concept possibly further transformed into other concepts. The concepts are later drawn together through conjunction to create new knowledge. The ‘C-K theory’ that Hatchuel and Weil (2003) have developed is clearly a set of principles on which a way of thinking can be developed. They suggest that their theory can not only be incorporated into design or product creation but into a way of creative and innovative knowledge creation. The ideals of the concept-knowledge principle can see found buried in the works of Brown (2008), Dorst (2011, Kuratko, Goldsworthy and Hornsby (2012) and Kolko (2010). Traditionally conceiving spaces for learning that meet the needs and requirements of our learners has been in the hands of administration and design teams, as they juggled the constraints of budgets and the concepts of education based on the industrial age. Even with acknowledgement for the need to change educational institutions, buildings continue to be build with little input from the beneficiaries as emphasised by Brown (2008). His design thinking process contradicts the approach taken by the federal government in school building development as exampled by the Commonwealth Building the Education Revolution (BER) program, which tied funding to template specific construction. An audit revealed nearly 60% of schools felt that there was a limited degree of flexibility and customisation possibilities as a result of template use (National Audit Office 2010). A visit to the school highlights the interactivity and transparency of the learning spaces, however it is evident that designers failed to consider the impact on acoustic and climate control of the building housing up to 370 students. Student flow is also disruptive with large groups of students having to negotiate learning areas to access practical spaces and teaching staff. This may suggest that an externalisation of the design (Kolko 2010) or immersion into teaching situations (Brown 2008) may not have been utilised in the design process to discover what would be known unknowns. The transference of design thinking considerations are more evident in a qualitative study conducted by Wills (2014). By analysing how one school created a new space for learning through teacher, student and leader involvement in the design process, Wills was able to demonstrate the development of knowledge and concepts through the use of immersion, research, discussion and conceptual tasks such as scale modelling within a school setting. By undergoing knowledge seeking, constraints were indentified. The process of synthesis of ideas was externalised through discussions, drawings and various visualisation techniques as identified by Kolko (2010). The ‘wickedness’ of this problem (Buchanan 1992) is highlighted by the reframing or replacement that resulted in reflection and generated shifts in pedagogy and further iterations of plans. The process also highlighted the emotional cost and personal development in using the design thinking process in this type of setting, and although the implementation of the design outcomes was realised, the intended audience of the design did not move into the new space. The use of design thinking for curriculum design was seen in the work of Melles (2010) who sought to use the process to develop a Design Thinking unit of study. Through a number of past and present research articles, expertise in design thinking process, examples from other institutions delivering similar units and framing, Melles developed a course for delivery. Melles argues that the development of a curriculum is ‘wicked problem’ and cites Buchanan(1992) to indicate the openness of the design process for the unit development and dependence on what the designer conceives. He acknowledges the abstractness of the course design and contends that there is a number of questions that remain to be answered. Melles concluded that these questions are relevant for the development and teaching of all education programs. When considering the principles of design theories or thinking into the practices of education it is difficult to find many examples of the approach in the development of physical structures of institutions within Australia. Educators are faced with working within the constraints of the pre-existing structures; shifting internal flexible furniture to suit the needs of the teacher pedagogy or changing teacher pedagogy to suit the changes of learner needs. Even the example of the ASMS fails to identify any immersion of the beneficiaries but highlights the constraints placed on its original construction. It is when analysing what is occurring inside the wall of institutions that evidence of the principles of design thinking can become evident. Design thinking principles are not just for product creation but can, and should, be embedded into the processes of thinking that educators and learners are able to take control of. Wills (2014) illustrated how the approach of teachers can lead to a shift of pedagogical approaches and a sense of ownership of learning spaces. The openness of the process enabled transparency in the development of the learning environment. This externalisation of thinking (Kolko 2010) is needed to answer the ‘what’s in it for me’ thoughts of learners as they grapple for meaning from their learning’s and it allows for a validation of a educators teaching. Curriculum design is able to incorporate the principles of design thinking to maintain an ongoing development of learning outcomes to suit the changing needs of learners in the 21st century (Melles 2010). Even timetabling of the learning program for educational institutions needs the creative and innovative outcomes of design thinking approaches to ensure all learner and educator needs are met. With the immersion and observation approach of Brown (2008) and the framing through abductive thinking of Dorst (2011), the synthesis of curriculum and timetables, that better suit the needs of the beneficiaries, can be developed. The process ensures the constraints placed on the institution are not the controllers of the learning but a consideration. The ‘wickedness’ of the problems posed by classroom structures, timetabling and curriculum development underline the need for ongoing thinking practices to embrace the shifting perspectives of education. Professional development in understanding changing learner needs, pedagogical approaches and new ideas in educational resources and technology, help create the shift in perspectives that lead to the continual loop through a design thinking process. When considering the C-K theory practices of Hatchuel and Weil (2003), they seem to encourage the deepest theoretical considerations for education settings. With their emphasis on knowledge development through disjunction to form concepts and subsequent concept conjunction into knowledge, this approach could help develop innovative and creative thinking within our learners. The principles used in the C-K theory could also be applied to other forms of problem solving strategies such as deductive and inductive reasoning. Design is word that connects theory and practice; the principles of which are constantly having to adapt to the changing circumstances of its context. The concept of design thinking allows for iterative and reflective learning, awareness of change and can bring about transformation of the learning space. How design thinking is processed in an environment is a source of conjecture for some examples of literature but the overarching principle of ensuring design is conducted in a collaborative, immersive and democratic setting is foremost in the ideals of the practice. Barr, A., Gillard, J., Firth, V., Scrymgour, M., Welford, R., Lomax-Smith, J., … & Constable, E. (2008). Melbourne Declaration on Educational Goals for Young Australians. Ministerial Council on Education, Employment, Training and Youth Affairs. PO Box 202 Carlton South Victoria, 3053, Australia. Fisher, K. (2010). Technology-enabled active learning environments: an appraisal (No. 2010/7). OECD Publishing. Hatchuel, A., & Weil, B. (2003). A new approach of innovative Design: an introduction to CK theory. In DS 31: Proceedings of ICED 03, the 14th International Conference on Engineering Design, Stockholm. Kuratko, D., Goldsworthy, M., & Hornsby, G. (2012). The design-thinking process in Innovation acceleration : transforming organizational thinking. (pp.103-123). Boston : Pearson. Willis, Jill. Making space to learn: Leading collaborative classroom design [online]. Journal of Educational Leadership, Policy and Practice, Vol. 29, No. 1, 2014: 3-16. This entry was posted in CSU INF536, Design thinking on August 31, 2014 by wasworks. Although the space selected for this task is not one that is visited every day, it is a regular feature of my week. The coffee shop is a popular shop in a small beachside town south of Adelaide. In the summer months the district comes alive with tourists; some from the Adelaide region, but many from all over the world. The town is known for its quaintness, beautiful swimming and surfing beaches, abundance of holiday homes, bakery and cafe’/coffee shops. This coffee shop was established at least 5 years ago and has a number of regular local and tourist clientele. It’s popularity has meant it can be difficult to access a table at times, but a takeaway coffee service can alleviate the problem. The main cafe’ area of the shop is approximately 7 x 10m, with a 2 x 7m verandah attached to one side and a 3 x 10m uncovered deck at the front of the store. Both the verandah and deck have tables and chairs, though customers need to enter the shop to access the verandah area. Knowing that the location of the coffee shop was not purpose built for the cafe’, it is obvious that the coffee shop has had to design the floor area to suit the constraints of the building. The previous staff/store area (out of sight to coffee shop users) are near the counter area has now become the kitchen, and the old counter has been re-purposed for greeting customers and taking orders. The coffee shop has made a point of re-purposing furniture and decorative items. In doing so they have been able to present a cosy environment. Large windows and north facing aspect provides plenty of light, while verandah roofing reduces the hot summer sun heating the shop. The furniture in the shop is generally close but not uncomfortably. Access is reasonable for most customers, though can be difficult when all tables are full. The staff seem to cope reasonably well with the flow through the space to serve customers. The counter area is generally kept efficiently clear of people waiting to place orders and the proximity of the front door near the counter means that an incoming customers can quickly assess if they will be able to locate a seat inside. The issue of focus for this task is that the size and location of the door at the front can cause an issue for the staff as they take orders outside to a few tables on the front deck. With the door being situated close the customer ordering area, opening into the customer standing area, having a reasonable weight and resistance, along with having a handle that is difficult to use if both hands are full, are obvious issues for waiting staff. Shop door and entrance making exit with food and drinks difficult. Entrance door opens into customers waiting at service counter. Entrance door is currently only access into and out of shop area. Entrance door allows wheelchair access. Door is pinned open during ‘fine’ weather days. Satisfaction of staff in using the door whilst delivering orders. The coffee shop is is developing into an unique aspect of a small seaside town, but the welfare of the staff in integral for the continuing success of the business. How can the current customer service be maintained, yet simplify the movement of the staff? A perspex(or glass) with wooden frame door (to fit into current door style) is added to front entrance. During working hours the main door is pinned open and this secondary door, which has a lighter frame, is used. The secondary door is pushed open from the inside, swinging out onto the deck. Replace lever handle with pull handle and install ball catch mechanism to keep door closed. Credit to Jim and Lisa for helping with feed back during Design Brief drafting. Thank you. This entry was posted in CSU INF536, Design thinking on August 14, 2014 by wasworks. Ill-conceived learning spaces are the bain of many an educator. Student engagement, focussed learning and even respect for the learning environment can all suffer with a space that has not met the needs of the student. Within my school a building was recently constructed for Vocational Trade Training and Information Technology. Now completed, the building is frequently utilised by classes, small working groups and individual senior students. Within the building an area that initially presents as a large foyer area, is being used as a workspace for small groups requiring somewhere for group discussion, or for quiet individual computer access. The zone, identified as HUB 1, is essentially undefined and tends to shift purposes with each group moving through the building. This attitude tends to see teachers not utilising HUB 1 for task oriented purposes but more of an area of ‘overflow’, with greater teacher interaction happening in another room of the building. Obviously the area becomes more of a social centre, an escape from the rigours of the supervised classroom and a perfect zone of work avoidance. The Design Thinking Toolkit identifies that the physical environment of the classroom sends a signal about how students should behave. The HUB 1 area is obviously not sending the right messages for students or teachers to engage in the space effectively. But possibly at the core of the issue is the unidentified purpose of the space and a sense of ownership by the people that use the space. It is Tim Brown (2009) who imagines a simplified three key phases in the process of design thinking. He initially sets to link innovation and creative design through design thinking and then identifies the phases of ‘inspiration’, ‘ideation’ and ‘implementation’ as the steps towards product development that suits the need of the consumer. Each phase is linked, with intermediary phases interwoven though the whole process to finally execute the vision. (Brown 2008) In assessing the ‘product’ of the initial building design, it is obvious that the space no longer meets the needs of the intended purpose, that is an effective learning space for students. Kuratko, Goldsworthy and Hornsby (2012) identify that a pitfall of some people is to hold on too tightly to the original insight and that an open mind needs to be maintained about the possibilities for an idea. The original idea for the HUB1 space needs to be redesigned. To instigate initial small changes in the HUB1 space, it was essential to first talk to the students that use the area. It was clear from the conversations that they needed a space that allowed group discussions without disrupting the students working in the main computer area. Initially a small table was obtained from a nearby room, but further searching found more suitable tables. In true prototyping style the students ‘tested the product’. Photograph 3: The HUB1 final look. Although the changes to the space are small, and possibly an obvious addition to the building, this design change still needs to undergo some more consideration. How the group collaboration area affects the availability of the quiet study space needs to be considered. It is agreed the space is very under utilised and there is more that can be investigated for creating a valuable learning space. Brown, T. (2009). Change by Design: How Design Thinking Transforms Organizations and Inspires Innovation. HarperBusiness. p.37. This entry was posted in CSU INF536, Design thinking on July 31, 2014 by wasworks. A simple coffee shop experience has been turned on its head with the inclusion of an observation exercise. Normally I am immersed into my thoughts and conversions with a counterpart,as I sip a pleasurable cup of quality tea or latte. Covertly observing the normal day to day interactions of coffee shop clientèle and staff with the surrounding environment had a sense of James Bond, though in my case possibly ‘Secret Squirrel’. Knowing that the location of the coffee shop was originally a small clothing store, it becomes obvious that the coffee shop has had to design their floor area to suit the constraints of the building. The previous staff/store (out of sight to coffee shop users) are near the counter area has now become the kitchen, and the old counter has been re-purposed for greeting customers and taking orders. The coffee shop has made a point of re-purposing furniture and decorative items. In doing so they have been able to present a cosy environment, which they are renowned for. In observing customers and staff for the half hour suggested it was interesting to note the concessions that the staff have had to make to work in with the shop setting. With limited space on the shop floor and the need to make the shop viable has meant that tables are close together, and uninhibited movement by the staff is not always possible. This is particularly evident when a staff member needs to exit to the outdoor area. A large door, with awkward handle, has to be negotiated with customer orders in hand. If the day is cool, then the door needs to closed behind them for continued customer comfort. This coffee shop is a busy place on weekends in the summer and is usually full of tourists seeking cooked breakfast, light lunches or relaxing coffee and cake. Although the day of my visit was a cold winters day, it was still quite a busy with most tables full. The talk amongst customers was casual and none seemed to be uncomfortable with the general noise or movement through the area. The temperature was cool outside but pleasant in the building. The large extensive windows provide plenty of natural light which is supplemented with a small number of ceiling lights. To counter the closeness of the furniture on the floor, the coffee shop has kept the decorations simple with a classic/retro theme. Again the windows have helped open out the perceived area. Children are welcomed and the staff have a supply of item to cater for seating young toddlers, or entertaining older children. The padded seat along the back wall is popular with families and older visitors as it is surprisingly easy to access with a pram or walker frame. In the time I was there the range of customers extended from a baby in a pram to an elderly man in a wheel chair. The chairs however needed repositioning to suit the wheelchair and a table was shifted to enable access. The staff seem to cope reasonably well with the flow through the space to serve customers. The counter area is generally kept efficiently clear of people waiting to place orders and the proximity of the front door near the counter means that an incoming customers can quickly assess if they will be able to locate a seat inside. The size and location of the door at the front can cause an issue for the staff as they take orders outside to a few tables on the front verandah. With the door being situated close the customer ordering area, opening into the customer standing area, having a reasonable weight and resistance, along with having a handle that is difficult to use if both hands are full, are obvious issues for waiting staff. In looking at the design of the space utilisation for this coffee shop, it is evident that the owners have sort advice, or undertaken a design process. It would be hard to imagine that good fortune has lead to such a customer friendly environment. I would also suggest the the staff is also carefully selected, as some concessions need to made to cater to the needs of the customer. This entry was posted in CSU INF536 on July 30, 2014 by wasworks. The digital essay I completed for the Assessment 8 of INF530 was in iBook format and can be downloaded from the Dropbox link above. This entry was posted in CSU INF530, Reflections on May 30, 2014 by wasworks. It is difficult not the play on the metaphor of travelling on an express train, when trying to establish a starting point of reflection for INF530. The sensation of being swept along with the excitement of making connections within new information environments, engaging in group discourse, conducting academic inquiry and immersing yourself within extension research readings, was at times overwhelming. Moments of personal reflection amid the fast paced information flow left the thoughts spinning whilst grabbing at emerging possibilities for future learning. With the pace of the course now beginning to ease, there is a sense that so much more could have been gained. Throughout the course I have challenged myself to delve into the content, explore the concepts and ideas being presented, and then synthesise the various aspects covered into communicable thoughts. With these thoughts I then endeavoured to engage in discussion with my professional peers in an attempt to refine the network of understandings. At times my depth of understanding was shallow and warranted further research to give a more sophisticated edge, but I felt there was value in this process so as to ground the learnings into the real world. With the participatory experiences presented in the course, such as the discussion forums, tweet meets, hangouts and adobe connect sessions, the opportunity was taken to engage in further discussion on course work. I found the depth of knowledge and experience the course cohort were sharing in this medium extraordinary. The ideas, opinions and links the group shared added to the subject value and spread another layer of complexity of thinking in my already overwhelmed thought processes. There was a certain level of engagement by me in this aspect of the course, perhaps more evident in the earlier weeks. The discourse I shared with my work peers was not as easily reflected into the digital medium as I struggled to express my understandings in a timely and succinct matter. This aspect of engagement in online learning is an aspect requiring ongoing development. It highlighted the hesitation and wariness that my students must feel when required to engage in online collaborative tasks. During INF530 the required and recommended readings, scholarly book review and digital essay research initially required a level of extrinsic motivation, with the demands of other professional reading battling for limited time. But as the appreciation for the perspectives of ‘digital promoters and opponents’ developed, there was a shift in the scheduling of reading time. Writers such as Boyd, Davidson, Zhao, McGonigal and Wagner and thinkers such as Rhiengold, Whitby, Robinson and Gee changed my perspectives on a number of aspects of my role as an educator. My shift in the value I place on digital connections in the workplace and for learning, has gone from an educator’s interest to being passionately seen as an essential aspect of any educator’s life. There is also a deeper appreciation of the complexity and value of digital mediums in a child’s education and position in society. When reflecting on the objectives and outcomes of INF530, I find that through my interaction with the course learnings, I have come to understand the importance of networked, connected learning. There is a fundamental need for there to be a re-imaging of the learning that is happening in our schools. The globalisation of economies and education have an crucial link that will impact on the futures of today’s youth. They will need to be creative and innovative, be able to generate valuable learning networks and understand the flow and curation of information. As educators we are entrusted with the development of the capabilities of youth. We need to be 21st century educators and learners. The world is changing, technology is changing, and education must change. Resistance is futile. The tasks of a scholarly book review was extremely daunting. Concepts and Practices in a Digital Age, delivered through CSU, challenged us to delve academically into a book and examine the the writings of the author to produce a critical assessment. The learning path taken in completing this task has been immense and, although the outcome has its faults and lacks some academic finesse, I am pleased that have taken the journey. Davidson, C. N. (2011). Now you see it: How the brain science of attention will transform the way we live, work, and learn. New York, NY: Viking. In the book, Now you see it: How Technology and Brain Science will transform Schools and Business for the 21st century, Cathy Davidson (2011) explores the possibilities of the educational and workplace world of the future. Using an array of collected research findings, personal anecdotes and active research, she pieces together an argument for the refocus on the structure of the current education system to take advantage of the human brain plasticity and attention direction. Dr. Davidson currently holds the two distinguish positions of the Ruth F. DeVarney Professor of English and the Hope John Franklin Humanities Institute Professor of Interdisciplinary Studies at Duke University in North Carolina, USA. She is also due to move to a new position where she will hold an academic appointment in the Graduate Centre at the City University of New York, in the English Ph.D program. After graduating with a Bachelor of Arts in Philosophy and English in 1970, Davidson went on to complete an M.A., Ph.D in English and complete postdoctoral studies in linguistics and literacy theory. During the period of 1998 to 2006, Davidson served as Duke Universities Vice Provost for Interdisciplinary Studies, during which time she helped develop over seventy collaborative programs particularly in the area of Information Science. She initially drew intense criticism for her role in the introduction of ‘iPods’ into the Duke’s academic program in 2004, which went on to provide the grounding for iTunesU and podcasting conferences. Cathy Davidson has written or edited over 20 books and is now a frequent speaker and consultant on institutional change. The book, Now you see it, has been written with the educator, particularly an educator of Information Literacy, in mind. However the scope of the book can include anyone with an interest in brain science, the impact of technologies in education and the workplace, and the future of education in the 21st century. Davidson’s style also allows for the general interest reader or those looking for intellectual enlightenment. The broad nature of the book with spirited stories, research examples and an extensive section of notes with references allows the book to be a source of extended research as well as light reading. The central key point of Davidson’s book is the phenomenon of attention-blindness and how distraction can be cultivated to enhance the learning experience. Davidson uses the research of Simons and Chabris (1999) and their gorilla experiment to draw attention to the way directed distraction can lead to many people failing to see what is later an obvious intrusion into a scene. Their research found that there is evidence of cognitive forms of blindness and this ‘inattentional’ blindness reduces the likelihood of noticing an unexpected object whilst focussing on a task (1999). Davidson then emphasises that with collaborative working the concept of attention-blindness, which dominates our everyday lives, can be used to harness a more holistic view of a situation. With teams of differing individuals an education or workplace issue can worked through as each person is able to focus on what draws their attention, and so identifying something that may have been overlooked by others. It is through this key point, Davidson draws on extensive research and scientific studies ranging from the work of de Waal (2009) and Edelman (2006), through to studies on autistic children to highlight the process of brain development, learning by young children and brain plasticity. Edelman’s work identifies pattern recognition within the brain sensory systems and how these recognitions can short cut conscious awareness in certain situations, while de Waal sought to understand teaching and learning through the concept of mirror neurons. These understandings are then woven into the constraints of the twentieth century education system, with is linear structures and age compliant progressions. Davidson works hard to draw on the point of the limitations of an education system established for the industrial age to emphasise the outcomes of her active research in educational centres that have embraced technology and the connectedness of the internet network. Within the text of Davidson’s research there is an indication that attention-blindness is overcome by the cognitive multitasking abilities of the human brain. Rather than viewing information provided by the networked internet as isolated facts, it is suggested that the brain is able to draw from several sources to gain a more holistic view of the knowledge sought. This, coupled with group collaborative activities such as crowd-sourcing, is the approach Davidson feels should be the emphasis of education reforms and teaching pedagogy changes. There are those, such as Rosen, that challenge the idea that the brain is built for multitasking. Rosen strongly argues that multitasking is a poor long term strategy for learning (Rosen, 2008, p. 105) and references several studies to support her claim, but Davidson presents the assumption that the brain is built for multitasking and uses it as a basis for the required reforms for a 21st century school. Davidson presents several examples of how these reforms can look in the future classroom. It is here that gaps develop in the flow of Davidson’s argument for a restructuring of the education system through the acceptance of the information-rich connections of the internet and the extensive use of connected, collaborative learning classrooms. With her position at Duke University, Davidson is privileged to engage with schools at the higher end of the digital divide that exist between education systems across the world. Her forward thinking examples seem inconsistent with the realities of attitudes that exist in schools. American writer Nicholas Carr has published two noted books arguing the detrimental effects of the internet on the brain and the coherence of society. He expresses this view which he feels is commonly held by an extensive number of people, many of whom hold key positions within the current education system (Carr 2013). The strength in Davidson’s book is the discussions centred on the transformations occurring in the modern workplace. As industry embraces the global connectedness of the internet, progressive companies are implementing changes from a less building centred work environment to transient workers connecting through the cloud. Davidson’s extensive research into the works of innovators such as Aza Raskin and technology company, IBM, highlights the ideal of removing the limitations of the workplace. Through the skills of collaborations, attention, multitasking and network connectedness, Davidson demonstrates achievable principles that worksites could embrace. Here it’s the decision maker that greatly benefits from the change, with workers collaborating with their strengths so benefiting the team in a flexible and decentralised workplace. There are a range of books that address issues in similar context to Davidson, but none seem to take the reader from the simplest understandings of the brain through to detailed examples of real life applications of the book’s concepts. A few authors attempt to analyse the effect of the internet on the brain, such as Rheingold who supports Davidson’s thinking through his work on ‘mind amplification’ (2013). He argues that through good design of digital media and web applications, there can be a leverage of human ability to think, communicate and cooperate. On the other hand, authors such as Carr (2013) and Bauerlein (2008) use research to suggest that the internet is not advantageous to education, work or human intellectual development. Davidson’s overarching thesis is to discover the best way to learn using education and workplace psychology, cognitive sciences and innovative technologies. She endeavours to prove that the current approaches to learning and working were established for the early stages of the industrial age and that a new kind of learning, that embraces technology, is needed to develop critically thinking students who will become the future global workers. Now you see it, is a book designed to look closely at the science of attention and the implications of attention blindness on the current thinking for education and workplace systems, and the necessary changes as society moves deeper into the 21st century. As a global system of interconnected computer networks, the internet is able to provide a rich source of connections that enables the distracted brain to progress through information with organic flow, rather than like the compartmentalised chunks encouraged by the current education system. Davidson makes a courageous effort to link the learning abilities of the brain and the potential of the internet, to argue for reforms in the approaches to education in the 21st century. The book’s logical flow and progression makes for easy reading and also provides a starting point for educational reform debate. Her book, Now you see it, is a passionate plea for changes in how society should be educating our children and structuring the workplace. It is worthwhile read for anyone. Bauerlein, M. (2008). The dumbest generation: How the digital age stupefies young Americans and jeopardizes our future (or, don’t trust anyone under 30). Penguin. Carr, N. (2013). The shallows: How the internet is changing the way we think, read and remember. Atlantic Books Ltd.
de Waal, F. (2009). Primates and Philosophers: How Morality Evolved: How Morality Evolved. Princeton University Press. Edelman, G. M. (2006). Second nature: Brain science and human knowledge. Yale University Press. Rheingold, H. (2013). Mind Amplifier: Can Our Digital Tools Make Us Smarter?. Ted Conferences. Rosen, C. (2008). The myth of multitasking. The New Atlantis, 20(Spring), 105-110. Simons, D. J., & Chabris, C. F. (1999). Gorillas in our midst: Sustained inattentional blindness for dynamic events. Perception-London, 28(9), 1059-1074. This entry was posted in CSU INF530 on May 11, 2014 by wasworks. The final assessment task for the Charles Sturt University subject Concepts and Practices for a Digital Age (INF530), is to compose an academic essay that is presented within a digital medium. In pursuing a topic for this essay, I investigated forward into future subject modules where the topic of Creativity and Education in introduced. This unit struck a cord with me as I see a tremendous link with STEM education (Science Technology engineering and Mathematics) where I also have a desire to further pursue within my school. Creativity, innovation, invention, creation…all words that begin to define the approaches needed to enable our students to move towards pursuing a future in STEM careers. Ken Robinson (2011) in his book, Out of our Minds, and Tony Wagner (2012) with his book, Creating Innovators both stress on the need to develop creative and innovative thinking in our students for not only economic and sustainable needs of societal growth, but also for the future career prospects of youth. Using iBook Author, a digital essay in the .ibook or EPUB format (ebook) will be created to include video, audio, web links and photographs. The ebook will be directly distributed to readers via email until available in ibookstore. As our global economies move from the industrial to knowledge based economies, which is then replaced by creative and innovative economies, there is a need to develop the creative capacity of our students to become innovators. Research and educational institutions, industry and economist are looking for these innovators to be motivated, collaborative workers and have interdisciplinary problem solving skills, and these innovators need to grow from the approaches and practices of schools. The Australian Curriculum recognises that responding to the challenges of the 21st century requires youth to be creative, innovative, enterprising and adaptable. They will also need motivation, confidence and skills to use critical and creative thinking with purpose. The Melbourne Declaration on Educational Goals for Young Australians (MCEETYA 2008) also recognises that critical and creative thinking are fundamental for students to become successful learners. Both documents also identify that in this digital age, with its rapidly and continuing changes, students will need to be highly skilled in the use of digital technologies for knowledge sharing, creation, development and communication. The initial focus of the essay is to critically analyse the current ideas and principles of creative thinking in education, while the principle focus is how digital technologies are currently employed in schools, using creative thinking practices, for the development of innovative students. As I sit in the lounge chair, contemplating the intricate pattern of a scarf I am knitting, I am suddenly struck by the complexities of the the woolly pattern that is developing before me. Surely my repeating pattern of knit one, slip one, knit one, pass slip stitch over has not ultimately produced such a beautifully crafted, functional garment? How could such simplicity produce a complex network? It is here that my train of thought suddenly diverts to the complex structures of the internet’s web. The simple line of connectedness of one person as they weave their way through the links of information to form a complex path of knowledge acquisition. The beauty of that knowledge as it grows into a functional wealth of understanding and critical thinking. But where is the collaboration? Where have I linked into the path of another and allowed my thinking to meld into the thoughts of others? What beauty could I help weave if I allowed myself to blend into learning pathways of others? 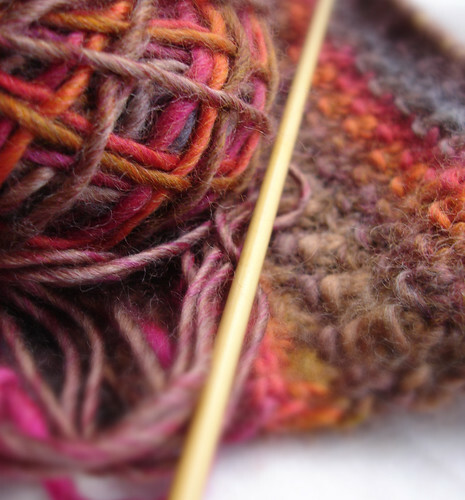 I look back at my knitting and reach for another ball of wool. The weave of another colour would make my scarf look exquisite. This entry was posted in CSU INF530, Reflections on April 30, 2014 by wasworks. Reflective Blog #2 – My head in the clouds. It seems that technology has been embedded into education since perhaps the first sharp stick scratched the etchings of thought into the sand. Each time a new technology for education is developed, it was generally for the improvement in learning. Higgins, Xiax and Katsipataki (2012) clearly advise that when technology is used to improve learning, it is essential to determine the problem the new technology aims to solve. But since the development of the first personal computer in the 1970s, there has been a steady influx of new technologies which have been entrenched to everyday life, with a seemingly natural flow on into the education of our youth. For a long time there has been an uneasy relationship between educational technology development and education practices. As new ideas, models and pedagogical approaches are discussed, learnt and implement in the classroom, teachers change to better suit the needs of the students and the demands of their authoritative body. Even in my own time of teaching there have been significant changes in the delivery, assessment and reporting of curriculum standards. My teaching has gone from the chalk and blackboard centred classroom, to the laptop and collaborative learner space. Each time a new idea was introduced, a rumbling of discontent or insecurity enveloped the staffroom. Many of these ‘technology in education’ inductions have been initially developed outside the walls of the educational institution, perhaps inducing resentment among the educators targeted for the technology delivery. In recent times there has been a fundamental shift in the attitudes of educators in the classroom. In her book ‘Tech-savvy kids, Parker (2010) talks of a shift in the attitude of educators to understand digital technologies to offer more engaged, student-centred learning opportunities within schools. Her thoughts, and those of Sheryl Nussbaum-Beach (2012), describe that with the advent of the internet and social media, the way students learn has changed and emerging web technologies have connected students outside the classroom walls. Educators, and researchers, are embracing the opportunities these technologies can bring to the class room. Many of the current educators are likely to be active ‘digital natives’ and see how recent digital technologies can be included in the school curriculum delivery. A recent research presented by the NMC Horizon Report (2013) has tried to identify, and describe, emerging technologies that will have a large impact on education in the coming years. In this report they identify cloud computing and mobile learning as becoming a pervasive part of everyday life in much of the world, and Reidel (2014) goes to say that these technologies are beyond tipping point, with most kids not using the traditional computer connected to the internet at home. This likely has enormous implications for the 21st century educator in the traditional classroom setting. Where does this leave the staffroom rumblings? Hopefully these educators are busy implementing some of their own learning in the cloud with their own mobile devices. Higgins, S., Xiao, Z., & Katsipataki, M. (2012) The Impact of Digital Technology on Learning: A Summary for the Education Endowment Foundation. School of Education, Durham University. This entry was posted in CSU INF530, Reflections on March 29, 2014 by wasworks.